Case 295/05/17: Complainant: Zoetis UK Limited / Respondent: CEVA Animal Health; PRID DELTA Brochure PR152-L246-O615-1K and Promotional Activities. The Committee upheld item 1 of the complaint as being in breach of the Code but dismissed items 2, 3 & 4. The Chairman opened discussion on the case, suggesting for the Committee’s benefit, that the primary and first issue was whether the above brochure, the subject matter of the complaint, constituted a promotion. Although the Respondent maintained that they had now modified the brochure and had removed branding, the critical issue that the Committee had to consider, could only be based upon the form of the brochure at the time to which the complaint arose, which was in October 2016, at the British Cattle Veterinary Association Congress. In that regard, the argument of the Respondent was that although the taught use in the brochure was without equine chorionic gonadotrophin (eCG) i.e. off-label, the brochure was educational. As regards the extent to which the Complainant was justified in suggesting that the brochure was promoting off label use, and therefore contrary to clause 4.4 (iv), was not disputed by the Respondent, in that promoting the use of PRID® Delta in non-cycling cattle, not in combination with eCG is not within the SPC for the product. Extrapolation of circulating progesterone levels from a pharmacokinetic study to a field fertility study. 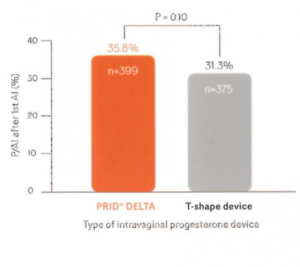 Circulating progesterone profile (Experiment 1) – “PRID Delta produced a significantly greater circulating progesterone (P4) peak compared to the T-shaped device and the area under the curve of circulating P4 was greater when cows received PRID® DELTA compared to T-shape device treated cows”. Stated in the brochure PRI52-L246-0615: “Final cumulative P/AI was greater in cows receiving PRID Delta (46% vs 37%, P=0.02) within 21 days after the initiation of AI compared to the T-shaped device”. On enquiry from the Chairman, members confirmed that at the BCVA Congress, whilst technical seminars would have been held, they would have been in separate rooms, wheras the stand was in a hall with several stands set up by various commercial entities, the primary purpose of which being promotion. The purpose in general, therefore, of the Respondent’s stand was commercial and therefore promotional in nature. The parties’ representatives were invited into the meeting. The Complainant’s representatives provided background as regards use of progesterone in cows by the two parties’ respective devices and the purpose of same, which is to increase the naturally produced reproductive hormone normally produced by the corpus luteum of the animal. An explanation was then given as to what happened in inserting a progesterone device in non-cycling cows and the role of eCG. Cows that received eCG at the same time as the progesterone insert was removed had better pregnancy outcomes compared to a progesterone program without eCG. Essentially the Complainant confirmed in non-cycling dairy cattle the need to provide eCG following use of the Respondent’s device and product. The particular technology of this requirement was closely questioned by the Committee. It was further explained that there had been several attempts to reach agreement with the Respondent over the use of the brochure, which had not been achieved. The Complainant then continued to deal with items 2, 3 and 4 in detail, arguing that the use of the references, comparative experiments one and two relating to item 2 and the field study presented an extrapolation which was unbalanced, inaccurate and misled. Likewise it was suggested as regards items 3 and 4 that the recitals without proper explanation, as provided by the paper relied upon again, served to mislead and were thereby inaccurate and unbalanced. Reverting to the issue of the material being promotional, the Complainant emphasised the fact that it was not disputed that it was reflecting off label use and therefore not consistent with the SPC, the indications of which were then set out and explained. The Complainant sought to dispute the possibility of the brochure being educational, as alleged by the Respondent and emphasised that in the context of the use of the brochure at the BCVA Congress, it was clear that brochures were available and that indeed a member of the Complainant’s team at the congress had obtained one easily, without any form of enquiry being made of those running the stand. The Chairman raised two points. In the context of item 2, he sought confirmation that experiment 1 was not prohibited and nor was experiment 2. The Complainant’s representatives emphasised that the complaint was not in any way against the terms of either experiment but rather the extrapolation and use of references from the paper Van Werven T. et al (2013) without giving a proper explanation of how the field study and the two experiments in question properly related to it. Secondly, the Chairman asked if it was accepted that the references were verbatim and accurate recitals which was confirmed. A discussion ensued and a number of questions were raised, particularly as regards item 2, but also items 3 and 4, to establish exactly what and how the complaint was being made in relation to those items. The Respondent’s representatives were then invited to respond. The Respondent commenced by dealing with item 1, alleging off label promotion, and gave an introduction claiming that there was a fast evolving science involved and that as a result the Respondent was receiving a high volume of product enquiries and the off-licence use, the subject matter of the brochure and that was the reason for having the brochure in order to help educate veterinary surgeons. The Respondent put forward the chronological order of events commencing in May 2016. It was emphasised that old booklets had been destroyed with evidence being shown to support that fact. The Chairman raised a query regarding the complaint which dealt with the stand in October 2016 and the availability of the brochure and also the promotional item at the back of the stand, to which the Respondent’s representatives did state that with hindsight they might have dealt with it in a slightly different way but that they still maintained it was effectively an educational piece. They emphasised in a summary in relation to item 1 that the particular brochure will never be reproduced and had not been reproduced since June 2016. The Chairman queried this and it was explained that the provision of the brochures on the stand was effectively using up old stock. He also queried exactly how these brochures may have been used in the meantime and whether had been, for example, distributed to veterinary surgeons’ offices or in any other sort of manner, to which the representative was not in a position to give an answer, but emphasised, that it was always intended the brochure should be used for educational purposes. It was emphasised that sales representatives had received very clear instructions that they were not in a position to distribute the brochure save in the context of enquiry being made. To this point the Committee raised several questions, regarding the nature of the event and the extent to which the actual hall in which the stand existed could be truly said to be for educational purposes. The Respondent confirmed that as far as the representatives were concerned, the sole purpose of the brochure and its provision was educational but did agree that the stand did not form part of a seminar or educational event in that sense. It was also accepted that the brochure was clearly off label drawing attention to certain elements, particularly the graph, it was not disputed that what was being described in the brochure was an off label use. The Committee questioned the Respondent on the precise purpose of the graph in question. The Chairman sought clarification as to the purpose of the stand, whether there was a point of sale in the sense of provision of data and in particular the brochure and the answer was that the purpose of the stand was to promote their products. The Chairman then sought how they were able to distinguish from the purpose of the stand being promotion with the argument that what they were doing was not promoting off label use. The Respondent acknowledged that not providing eCG for non-cycling cows following use of their device in the provision of progesterone would constitute a use that was not within the authorisation of the SPC for the product. Further questions were raised as regards the argument that the perceived educational purpose of the brochure in some way provided the justification for what would appear to be promotion of an off label use. The Respondent repeated their view that it was meant to be educational to veterinary surgeons and their sales team had been given strict instructions regarding its use and provision of it. The Chairman then raised further queries in the context of items 2,3 and 4, in particular referring to the arguments of extrapolation as had been maintained in the presentation by the Complainant to which the Respondent said that in their view the brochure, which was clearly intended for qualified veterinary surgeons, had references to the relevant paper and that it was entirely usual in the context of use of such documentation, whilst relying on certain accurately recited elements from the paper, also to rely on the ability of the veterinary surgeon reader to take account of the clear reference made and to examine the paper to the extent necessary to ensure that there was a full and complete understanding of what was being stated. The Chairman on behalf of the Committee, thanked the representatives of both parties for their excellent presentations, and they left the room. ITEM 1 : Off-label promotion of PRID® Delta in noncycling cattle, without the use of equine chorionic gonadotrophin (“eCG” in the past called PMSG). The Committee noted that the Respondent accepted that the brochure did promote an off-label use, which was not consistent with PRID ® Delta’s SPC, but in its defence, maintained that it was educational and thus not a breach of the Code. Firstly, ignoring its use, it was clearly promotion within the wide meaning of such at Clause 1.1 of the Code, a fact effectively accepted by the Respondent’s representatives. Secondly, the promotion was not in the nature of what would constitute education permitted to be given to the general public as permitted by Clause 4.2 of the Code. As was acknowledged and indeed argued by the Respondent’s representatives, it was directed to the veterinary industry, the Respondent seeking to rely on the technical information exclusion in Clause 4.4 (iv) of the Code. Fourthly, the Committee were mindful of the information provided by the Complainant’s representative that a copy of the brochure had been picked up at the Congress without any request or enquiry made to the Ceva representatives at the stand; and the photograph provided by the Complainant of the stand clearly indicated the availability of the brochure. This information was not disputed by the Respondent’s representatives. The Committee, however, did note that the publicity sheet at the back of the stand was in fact compliant with the SPC, unlike the brochure. Fifthly, the brochure was plainly intended to be a promotion document for PRID® Delta rather than providing balanced technical information as to the benefits of off-label use of intravaginal progesterone-inducing devices including PRID® Delta. Accordingly the Committee held that the brochure PRID® Delta Brochure PR152-L246-0615-1K and its use by the Respondent at the BCVA Congress in October 2016 was promoting an off-label use, which was thereby inconsistent with the product’s SPC and as such a breach of Code of Practice clause 4.4 (iv) and did not fall within the narrow exception in Clause 4.4(iv). The Committee noted that the excerpts quoted in the complaint as reproduced in the brochure were in themselves essentially verbatim quotes from the paper referred to (Van Werven T., et al (2013)). Given that the brochure was clearly intended for its readership to be qualified veterinary surgeons or those training to be such, and that the details of the referenced paper itself was clearly denoted, the Committee did not feel the complaints of the Complainant, were justified, in the context of separate breaches constituting misrepresentation and inaccuracy or lack of balance, contrary to clauses 4.3 (i), (ii) or (iii), or 4.4 (ii) of the Code. In essence, the Complainant’s complaint was that although the quotes accurately reflected what was said in the Van Werven paper, there was a lack of balance because of the failure to include certain remarks made in the Discussion section of the paper. The Committee did not accept such, in particular because those remarks did not materially undermine the factual findings in the Van Werven paper which the Respondent relied upon, but were rather in the nature of general discussions concerning the interpretation of such results rather than their experimental validity. The Committee was mindful of the fact that the paper was peer-reviewed and to a large extent, the Complainant’s points were an attack on the experimental and clinical methodology used in that paper rather than an allegation that the Respondent had materially distorted the findings of the paper itself by overly-selective and one-sided citations. As the paper was peer-reviewed, there was no reason to consider that such methodology was flawed. We acknowledge the decisions of the Committee in Case 295/05/17 as set out in your letter of 13 June 2017. Promote any practice which purports to promote the use or prescription of PRID DELTA for an off-label use such as for non-cycling cattle without the use of equine chorionic gonadotropin (“eCG”), contrary to Code of Practice Clause 4.4(iv). We acknowledge providing any such promotional material inviting readers to make enquiry of our technical team emphatically does not come within the permitted exclusion within that clause for responses to technical enquiries which have to be initiated by a permitted enquirer and that in future we will observe this clause, exercising the limited permitted exclusion properly.